Star Trek fans who are also keen model makers will get a huge blast out of this new Revell kit, which contains not one, but two models of the U.S.S. Enterprise NCC-1701. 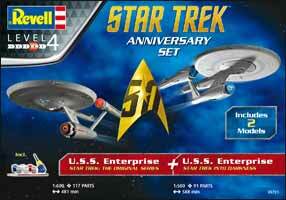 First we have the Enterprise from Star Trek: The Original Series. This contains 117 pieces, 1:600 scale with a length of 481 mm when constructed. Next up is the Enterprise from Star Trek into Darkness. This has 91 parts, 1:500 scale with a length of 588 mm when completed. This is the perfect kit for parents to enjoy with their children - although be warned, this is a level 4 Revell kit, so you'll need to be fairly up to scratch with your model making abilities. Parents / grandparents can relive their childhood building the Enterprise from the original '60s TV series, while younger generations can build the Enterprise they'll probably be more familiar with from the Star Trek Into Darkness movie. The kit incorporates typical large area saucer sections; Separate Command Bridges; Multi-part deflectors; Large scale two part secondary hull sections; Multi-part nacelles with separate pylons; Many transparent parts including Bussard ramscoop and navigation lights; Display Stands ; Building instructions with comprehensive painting instructions; and Extensive decal set for both enterprise construction kits. It also comes with glue and paint so that you have everything you need to construct the kits. It will come as no surprise, this is a Revell kit after all, to learn that the attention to detail is as you'd expect as is the sturdiness of the individual pieces. 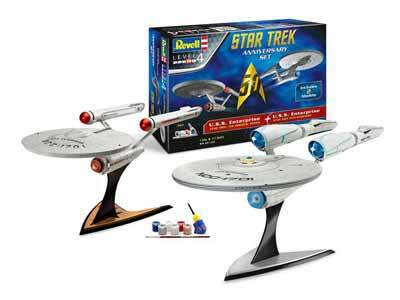 This is the perfect model for Star Trek fans of all ages.